“Life is not about the length of time we live. 432,000 looks like a big number. It is when you are talking about money. What if I told you that 432,000 is the number of minutes you have in 10 months of life? 432,000 does not sound as big when you measure it as a lifetime. Our beautiful daughter, Samantha Rose Scott, was with us for 10 months…432,000 minutes of gift time. Diagnosed with Trisomy 18 before she was born, we were told that she would most likely be stillborn. Samantha’s diagnosis was considered incompatible with life. Over 50% of babies with this are stillborn and of those born alive, over half do not survive one week and less than 10% will live to see their first birthday. Needless to say, the final 3 months of our pregnancy with Sammy were beyond stressful…yet amazing and beautiful at the same time. Along with her two older sisters, Chesni (7) and Kayla (3), we, as a family, concentrated on celebrating each day of the pregnancy. We learned to trust that God would give us exactly what we needed, when we needed it, to get us through whatever was ahead for our baby and our family. God had different plans and a huge purpose for our tiny daughter that was born on February 28, 2011. When Samantha arrived pink, beautiful and mad because the medical staff was messing with her, we were so thankful and knew we had been blessed with the gift of time. After a short 4 day stay in the NICU in Temple at Scott & White Hospital, we brought Sammy home on hospice. It was surreal to be cradling our newborn baby in our arms and making arrangements with Hospice. We were told we would most likely only have days with her because most babies with this disorder that are born alive suffer fatal episodes of sleep apnea shortly after birth. Life as we had known it was over! In between hospice nurse visits, doctor appointments and a new learning curve that included feeding tubes, syringes and ECI services, we began to have a new normal as a family. It was a beautiful day when our insurance kicked us off hospice care when Sammy turned 3 months because she was thriving! At Samantha’s six month cardiology visit, her cardiologist said that the holes in her heart were barely detectable! We were ecstatic as babies with t18 usually have major cardiac problems and began to hope that she would beat the odds and we’d get years with her. We learned over and over again on our journey with Samantha that God is not confined to a diagnosis and that He is in every single detail. We feel so blessed to have had 10 months that were relatively healthy months for Sammy. She was born with bilateral club feet, so we did serial casting and surgery to fix her feet. Like many children with special needs due to a medically complex condition, Sammy had feeding problems, so she was fed via a g-button. As her parents, we had a whole new learning curve and are now trained to do things medically that we never imagined doing. We also had a HUGE team of doctors and specialists working with us. By six months, we were on doctor appointment number fifty-two. Samantha also had a partial hearing loss, so she wore a hearing aid that looked like a little black box attached to a head band. It was a beautiful thing to watch her personality develop once she had access to sound! To be able to communicate with her was such a blessing! Samantha qualified for ECI services and some wonderful therapists became our friends and Samantha’s biggest supporters as they came into our home to help Sammy reach her full potential. Our eyes were opened to the world of children with special needs and to the joys and struggles that families in similar situations face. 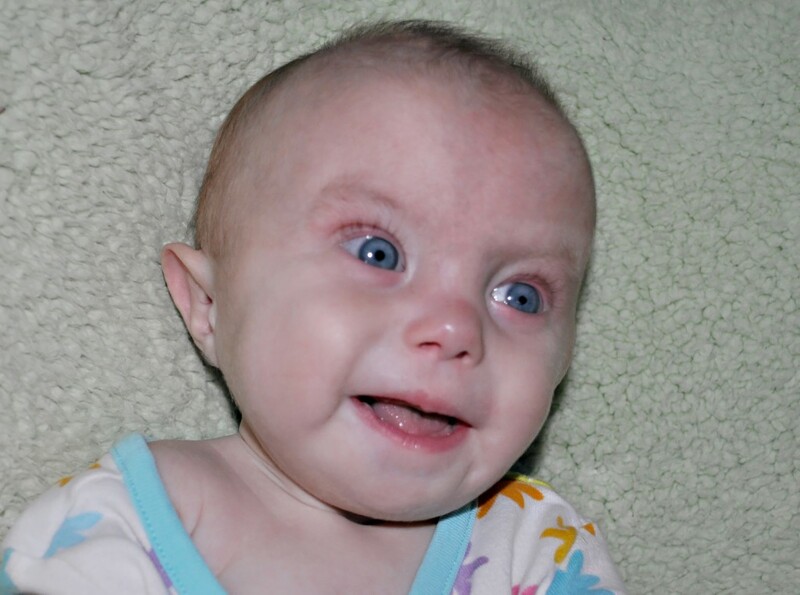 Trisomy 18 is a very medically complex condition and even though Sammy was very healthy for a t18 baby, she did have numerous challenges. It would have been very easy to focus on her condition and to live in fear of the future, but as a family we made a decision to focus on making each day count. We were going to live fully for as long as the Lord allowed. She went to football games to cheer her daddy’s team on, traveled to Colorado to meet her great grandma and family there, hiked the Rocky Mountains, went fishing and bowling and was just a baby that enjoyed being held and loved on. Some of Sammy’s favorite things to do were to be outside, to be taken for walks and runs in her jogging stroller, and playing with her sisters, Chesni and Kayla, who were wonderful big sisters! Being read to by her mommy and laughing at her favorite Elmo book were also things she loved. With a beautiful smile and striking blue eyes, Sammy was such a light and inspiration for all who met her. She was spoiled by her grandparents, aunts and uncles and was cheered on by her Zion Lutheran and Word of Life Fellowship families and her Vista Ridge Ranger family. She had people praying for her that we had never met, but who had heard about her story and were touched. On Wednesday, December 21st, when she was just shy of being 10 months old, Samantha was blessed to play Baby Jesus at Zion Lutheran School’s Christmas play. That was a beautiful night for our family…we never thought we’d get to do “Christmas stuff” with Sammy and to be asked to play Jesus was a wonderful visual reminder to everyone there that God uses the weak to touch the strong. By the next evening, we could tell she was coming down with a cold. What we thought would be a mild cold quickly turned into a horrible upper respitory infection and pneumonia. On Christmas Eve Day, we knew we were looking at limited time and made our second trip to Dell Children’s in less than 24 hours. Sammy fought as hard as she could, but it proved to be too much for her tiny little body. At 1:27 a.m., early on Christmas morning, Jesus came into a hospital room, gently lifted our baby’s sweet spirit from her Daddy’s arms, and carried her to her Heavenly Father’s arms. How special God must have thought she was to allow her to play Baby Jesus at the play and then meet Jesus 3 days later on Christmas Day! On December 31, 2011, a church full of people that loved Samantha and were inspired by her, came together to celebrate her beautiful life. The same school children that included her as a cast member of the school play the week before were now sending up the same beautiful song to her in heaven. As her family, we are slowly learning how to live without her. It’s painful and we miss her more than words could ever express. Our tiny little girl left a huge hole in our lives and even though we know she is safe in our Savior’s arms, we grieve for her. We cherished every smile, giggle and coo and we are forever grateful for each moment and memory. We are so blessed and honored to have been her parents. She made us all better people and we are humbled to see God continue to use her life and the life story that she wrote in her 10 months to change lives. Her life may have been brief, but what she showed to those around her will continue on. Those months completely changed who we are and taught us that God is truly in every detail and has a great purpose for each one of His children. Samantha’s purpose was to teach us what unconditional love is, to open our eyes to the world of special needs children and what their families face, and to bring people to Christ as they witnessed His hand in her life. She touched more people in her ten months of life than many people do in an entire lifetime. Life is not about the length of time we live. It’s about the way we live in the length of time that we’re given. She taught us that each and every day is a gift. TODAY is a gift. A body that works and is healthy is a gift. If you lived for 10 months with that mentality, what would the next 432,000 minutes of your life look like? What can you do in 10 months? My first son, Christopher Lee, was born with Trisome 18 and only lived for 6 hours. He was born without lungs and also had club feet. It was a very sad day, and my heart goes out to your family. Hi, my name is Tara Gray and I came across your story at Cox Elementary. My heart goes out to you and your family. Samantha seemed like such an amazing little girl. We too lost our daughter at the short age of 6 months from an illness. She had Noonan’s Syndrome. She blessed us with her life. We have 3 other children. After her passing, I joined an organization called Candlelight Ranch. It provides an outdoor experience for kids with all kinds of challenges. One of them being terminal illness’s. We were able to name the only wheelchair accessible Treehouse in Central Texas after her name. Now called Reese’s Treehouse. I have been President of the organization, but we moved to New Mexico for 18 months and now I am back…serving as Vice President. I would love to show you the Ranch and even see how we could collaborate efforts. As a parent, I know how much doing all this allows us to know their spirit goes on forever. I am a better person after falling in love with Reese. She was such an amazing little girl too. Please email me back or feel free to call me. We have one son attending Cox Elementary and live in Cedar Park. I work as a Labor and Delivery nurse and your story touched me in so many ways! There are so many families who decide to take a different path than your family did and it is heartbreaking to be a nurse in that situation! God will greatly bless your family for trusting Him to take care of Sammy and all the difficulties you all faced together! I can only hope to impart some measure of comfort as a nurse to the families I encounter, no matter the path they have chosen. Your story is the most beautiful thing I have heard and I will never forget little Sammy’s amazing life story! God Bless you and your family as you heal and may He give you peace that your little angel is in His arms!!!! We will never forget the 2 lovely L&D nurses that we had when Samantha was born. They will always hold a special place in my heart and in my memories of the day we welcomed Samantha into the world. You have such an important job and being supportive of families like ours that come into your care is a huge responsibility. Thank you for taking the time to read Sammy’s story and to share your thoughts and perspective. God has chosen a path for us that we never imagined, but what we have learned and the perspective He’s taught us is something I would never change. Thank you for the important work that you do as a nurse! What a story to read this morning! Sammy’s story made me stop and think how we should cherish every minute we have. I can only imagine how difficult these times were and yet you took the time to use every minute of it and give her the beautiful life she deserved. Thank you for sharing your story.